We got out this weekend and with the higher water on the Caney Fork, although we may fish it on two in the near future, we ended up at the Elk. Saturday night brought severe storms here in Middle Tennessee, but Dan and I made our minds up to hit the river regardless of the conditions. After the trip last week I wanted to see what the recent generation and higher sluice/spill was doing for the river. We arrived at the Elk to find an improved river! Thank you TVA and TWRA for the help with the water quality! There was no green slime and you could see the bottom for the most part at least up in the Upper Section (above the two mile mark) of the river. We figured it would be pretty muddy downstream with all the small creeks that run into the river at various points, which had nothing to due with my comparison of the water for this trip. That was correct, but the mud should move on downstream with some settling on the bottom until the next round of generation. We started off the float by bringing to net some of the recent stockers. Both rainbows and browns came out to greet our nymph and streamer offerings. The rumor mill is churning with talk of a large number of stocker browns due to be released this year. If the fish can run the gaunlet, get themselves downstream and spread out it would be good news for the coming years. We threw various colors throughout the day from white to black. The best colors for this trip were green/white and purple/black. Streamer action was at a premium and making the marabou move was critical. The action of the fly seemed particularly important, with a super slow retrieve early in the day and a bank pounding Run and Gun approach working later into the evening. Right now I would say the Elk should produce pretty well in the upper section as the fish move around the bend and down through the rock chute. The middle section still has not produced as well as last year, however it is still a little early in the season. The lower section continues to produce here and there, but the weeds have not gone away. 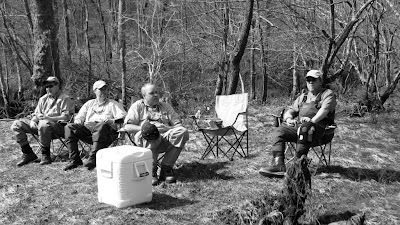 Springtime is firing up and the dogwoods are popping here and there, it is an exciting time to fish in Middle Tennessee. I’ve been noticing art since I began fishing with Dan Sharley over a year ago. I don’t have the eye for art like some folks; however I tend to like art with a story behind it. The next day on the way to the river with Dan. We were talking about the different Buffett concerts we have been to and the stories that inevitably come from attending one of these festivities. Dan had done some research in the past on Gardner McKay and said the story of the man was worth looking into. I did some quick Google work and did indeed find Gardner’s story most interesting. Also, I happened on a web-site for Madeleine McKay. I was clicking through her different paintings and found the “Catch of the Day”. . I needed something different for this month’s Home Page, or Dan was going to have to start painting more. Madeleine’s work came to mind and I dropped an email to her in Hawaii. She graciously gave her permission to use her work for the month of April. I guess in a way this all just fell together. I will keep your email and send you a note later if you are interested in reading Gardner's autobiography "Journey Without a Map" which should be coming out in early summer. He wrote the book as he was dying and I think you might find it interesting. So, there you have it……the long way around to a story of finding a great piece of artwork. Thank you Madeleine for helping me out with the home page this month. And to the rest of us fly fishing enthusiasts take a stroll over to Madeleine McKay’s on-line gallery for some very nice and interesting work. 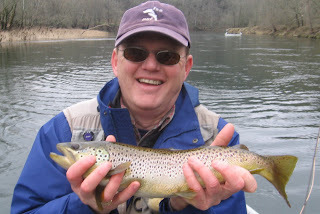 Saturday, March 21st, 2009 I hit the Elk River with Nabours and Friends logo designer and Calvary Outfitters charter member, Blake M. Blake has been fishing for a couple of years now and I hoped we could help him the big fish. We launched the boat early for shuttle purposes and were soon underway. I was concerned by the time we floated to through the Bend Pool. Not just from the absence of fish, as you know there is no better boat to spot the fish than from a drifter, but, because of the water quality. Last year around this time the river was in very good shape, however the water quality tells a much different tale this year. Now, I am not going to poor-mouth the water quality on this report, too much. If you want to know the quality of the river, just take a ride down there and look or at the least drop me an email and I will let you know what we found. I am concerned enough with the quality of the water that I have already sent some emails this morning. Also, I will be attending the Calvary Outfitters meeting on Thursday, March 26th, where TWRA will be speaking about the Elk. Back to the fishing, it was not the stellar day that I expected, but not a bad day to be out either. 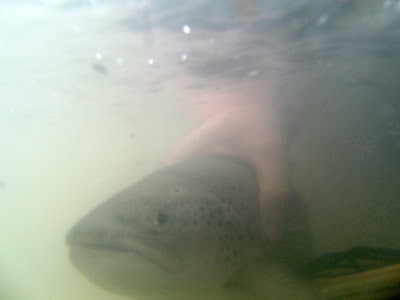 We threw Big Uglies most of the day turning several nice fish; we had some hits, hook-ups, saw some and caught some fish. We ran through the color chart on the flies a couple times and surprisingly purple was a good color to catch their attention. Yellow worked very well and picked up a brown and a rainbow on back to back retrieves. Blake lost one extremely nice brown and turned the largest fish I have ever seen on the river, but the fish chased the fly instead of getting around in front of it to eat. We were still talking about that one when we got arrived back in Murfreesboro. We finished the day talking with Guy and Rich, who had floated from Farris Creek down to Old Dam Ford and stopped by the ramp as we were loading the boat. They reported much the same water conditions. Blake was able to cast a lot yesterday as we moved slowly along the river and began to haul off the front cast some by the end of the day. Blake was a trooper and threw that 8 wt. for most of the day. Sometime after lunch I noticed his fly was landing at the bank or within a few inches, which is when he started getting the most looks from the larger fish. He also learned to swim the flies and how different patterns should be fished with different retrieves. It was good to have Blake on the boat and I am looking forward to fishing with him again. Blake Working Some Deer Hair & Marabou Through A Deep Run. TVA has begun to release one generator this evening starting at 6:00 p.m. and they have said they will increase the flow to 200 CFS. This should help the river overall and move some of the nastiness out of the upper sections of the river. Thanks TVA and TWRA for your response. Technical Tips From Southeastern Fly and Fishing Reports from Around the US. As some of you know I have been writing articles for the Little River Journal. I have just finished the first of a two part series on tailwater fishing. For those of you who have signed up to receive the Journal look for a new article in the upcoming edition. For those of you who have not signed up here is a link just scroll to the bottom of the page and you will see the Journal Logo. Signing up for the Journal is painless and it comes to your email. There are several tailwaters in the Southeast that have ledges which seem to run miles upon miles. A ledge is not always just a large drop; sometimes a ledge can be as short as just two or three inches. 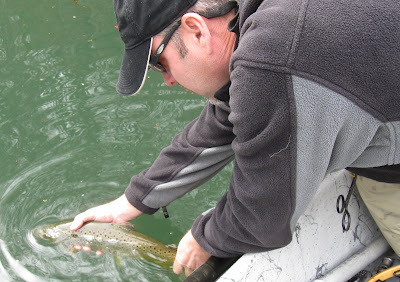 A 6” – 8” ledge is large enough to provide cover for almost any trout in the river. 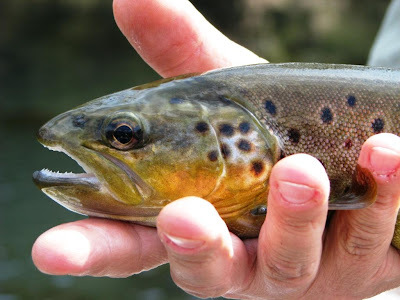 The South Holston, located in Upper East Tennessee, is a tailwater with multiple ledges for most of the upper river, arguably providing some of the best cover for fish in the Southeast. The majority of the ledges are of the smaller variety, but some can be larger and measured in feet. 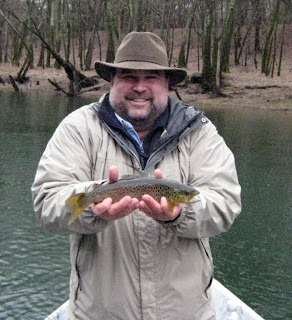 Most ledges are large enough to support the large trout that South Holston has become known for over the years. It is surprising how large fish will support themselves against a small ledge. Usually, the fish can be found holding just below the structure, as it provides a nice current break and an opportunity to rest. A long section of ledges can also produce additional dissolved oxygen. This is just a small portion of the part I. To help keep everyone in the loop with what’s going on in the world of fly fishing here is the second Fly Fishing Report from Around the US. I’ve touched base with some old friends in the fly fishing and guiding business from around the United States. These folks have agreed to give us fishing reports. See the Resources Page for their information. The Caney Fork is still producing some of the best floats for Southeastern Fly here in Middle TN. This weekend the Army Corps. is cranking some generation, but when the water is turned back to one generator it will be time to fish the "Big Uglies" (marabou and deer hair) again. The fish have been extremely cooperative this year as past reports indicate. The Elk River- Check back at the beginning of next week for this weekends trip. 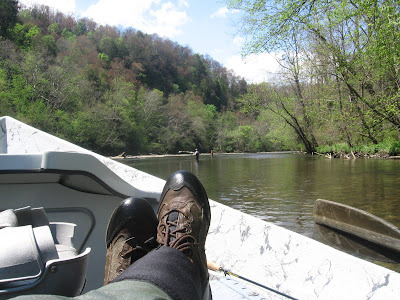 The Henry's Fork- Thanks to Jeff Etnyre of Hyde Boats for this report. Nymphing is still pretty effective. Midges will be the name of the game for a while until water temperatures warm up. When this happens, we'll start seeing blue winged olives. After eating tiny midges all winter, the fish look forward to the first mayfly hatch of the season. Its Official!! The Pompano just began showing up in the last week or so. We heard rumors that a fish or two were caught off the beach but for our purposes, yesterday was the day! Both Capt. Tommy Holland and Capt. 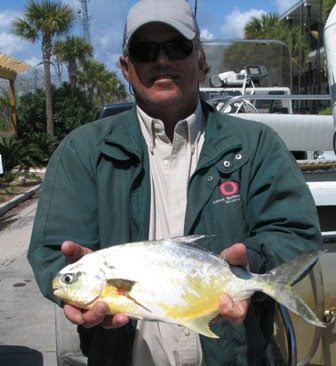 Dave Armentrout caught their first pompano on March 19th. Still waiting to hear if Capt. Nathan Donahoe has boated his yet or not, but the mild sunny days we've had the past few days have definitely made the difference. Spring Break is in full swing on the Forgotten Coast - maybe not quite as crazy-busy as in years past but that just means there's less traffic and quicker service in area restaurants. The inshore fishing has been over the top and we are looking forward to a banner month in April. 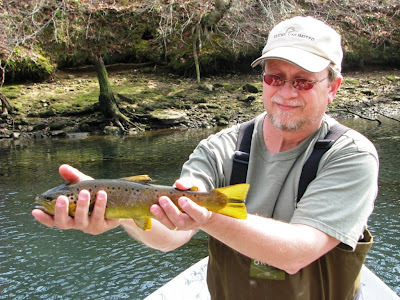 Kent Klewin of Real Job Fly Fishing says- The Toccoa River trout fishing has picked up the last week and we expect it to only get better with the warming trend in weather. The dun caddis have been hatching in low numbers but we are expecting there to be a heavy hatch during the beginning of this month. Blue Wing Olive patterns are still a go to pattern on overcast rainy days when they tend to hatch. Midge adults are hatching sporadically and there's a constant stream of midge larva in the foam lines available to the trout at all times. If warm weather continues we can expect to start seeing our spring mayfly hatches to begin. Thanks to everyone who makes these reports possible. Also, I want to give a Shout Out to everyone from the Cohutta Chapter TU and thank them for the press in their Newsletter. I look forward to floating with some of you this summer here in Middle TN. So, there we have a few things to browse while getting ready to hit the river. This weekend will be very nice in the Southeast and I am going to take advantage of the nice weather. Trips are being booked, which is a plus and I have set aside some time for my own fishing as well. When you get ready to book a trip I appreciate the consideration to help make your trip to Middle TN and enjoyable one. Click Here To Start @ The Home Page & Book Your Trip Now. We started the float at Center Hill Dam early on Friday morning. I was joined by James C., Mike, Rob and Robb. James is a local who fishes the Caney and the Elk. 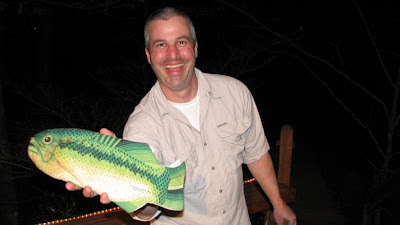 Mike is from the Middle Tennessee area, but hasn’t fished with a fly rod in years, but caught on quick. With one generator running Mike picked up on the 8 weight and streamer fishing remarkably fast. Rob and Robb are bass fly fishermen from Ottawa, which is just across the border in Canada and Northwest of the Adirondacks. The group was participating in a "Team Building Exercise". 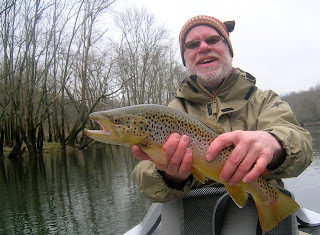 Rob and Robb were heading back to the frozen North on Saturday, so all four took a much deserved day off and booked a trip to the Caney Fork for some fly fishing. It was a little cool and damp, but for the first time in several weeks the wind was down. This is a positive change from previous reports and I for one am glad for the less windy days. Since there were four fly fishermen on this trip I grabbed the services of fellow guide Mark Roberts. Mark did an outstanding job putting his boat on fish and serving up the food while I attended to fly rods at lunch. Thanks Mark. We threw everything we had at them on this trip. We had flashes on every color but we grabbed the most fish on white. At one point during the morning a fish came up to and pushed a yellow Zonker about six inches, but didn’t eat it. That has been happening some this year, but this time it was in more shallow water. I had a good look at the fish when it moved the fly right out of its zone. This was pretty interesting stuff to say the least. Thanks James, Mike, Rob and Robb. I appreciate it and look forward to the next time. During the first day of floating we did manage to drown a few nymphs. BHPT's and sow bugs worked best. Gary was throwing his newest rod, which was a St Croix that he built himself. This rod added an easy 20 feet to his cast. The browns in the Little Red River are something to behold. Yes, there are some that were much bigger than we are showing here. But these are some of the most colorful fish I have seen in a while. Check out the tail color on the one above. Nymphs and sow bugs were the flies of the weekend. We drifted them below indicators, between wind gusts. Almost every nymph we tried brought fish to the boat. As long as we could get a clean drift, usually in the more swift water, we could hook up. But, if the wind grabbed hold of the line or the indicator, or both we couldn't even hook-up on a trash fish. Like I said before larger fish were taken on marabou and bucktail, which is our favorite way to fish. Sometimes the best fish of the day comes just after dark. On the long float as we were rowing out, below John's Pocket and above Winkley Shoal, we hooked up on a fish that felt to be one of those large browns for which the Little Red has become famous. The big stuff was working and when we return we will have an even larger arsenal of big flies to offer up. When we finally got the fish to the boat it was a slightly over-sized brown, but not that 40 pounder we were looking to catch. Once we un-hooked and released the fish we resumed the long row out. We’ve been planning our trip to the Little Red River for about three months. I was part of a group who were invited to spend a weekend at a friend's riverside home on the Little Red. Usually we take a spring trip and this time we slipped away a little early in the year to do a bit of fishing in one of Arkansas’ most celebrated trout rivers. We were on the road headed West just after lunch on Thursday, with a quick stop in Memphis to pick up the keys, as well as the guy who owns the keys, we were on the road headed West again. We managed to make a few stops along the way, including a stop to check out the new Supreme boats at a local dealer. These are nice rigs with plenty of space and an excellent design to draw very little water. The side trips delayed our progress a little, but we made it safely and in time to do a bit of night fishing with Big Ugly Streamers. Friday morning we stopped in the Little Red Fly Shop for a few flies and some information about the float of the day. I was a little worried about the wind, but we figured with all the turns we would be OK for at least part of our float…The part of our float that had the least wind was after dark and what seemed like well beyond after dark and just before first light the next morning. We launched the drifters from JFK Park about 11:00 a.m. for a 19,000 mile OK, OK, a 10 mile float. Yep, it was already late and we knew we had potential to be on an unknown river after dark. A little adventure is sometimes needed to keep life interesting. Throw in a few slaps of a beaver’s tail and you know exactly what I mean by “adventure”. There are some long flat water stretches on the Little Red which are tough on a fly fisher person, but there are also a good number shoals, stumps and other structure to make the float very interesting. One of the best parts of our float was below Cow Shoals. There are cold water springs, lots of structure and uneven bottom. Throw in a few bends, runs and shoals and you get me drift. We caught the majority of our fish in this section. But, the scenery of the river through this area was as good as a river East of the Rockies and West of the Smoky’s gets. On the more technical side we threw big nasty streamers into the wind, most of the day Friday, with some luck. Throwing to the bank and stripping back worked pretty good. Swimming the fly with various retrieves worked the best…..again. To pick up the numbers of fish we threw nymphs, midge patterns and/or sow bugs. Sow bugs became compassionately know as “Flat Bastards” Only, because sow bug sounds a little too bland for our taste. Naturally I threw a #12 BHPT with a big tungsten bead. After a while I only switched out the dropper to other patterns and consistently the #12 BHPT would out fish all the other flies I tried. The Little Red and the hospitality were outstanding. Below are a few pictures of our trip, with rest to follow in Part II later this week. We have some trips on the books, in and around Middle Tennessee, so look for those reports as well. I hope you enjoy the photos and report. Over 83% of the anglers who voted on the recent poll want to see more techniques. And, the rest of the anglers want to see the reports from around the country. We can do that. Already in the reports I have begun to add a little about the techniques used to catch some of the fish we have been catching. In the coming weeks and reports look for additional information on what we used and how we fish what we use. Update- today I have been tying flies for our trip to Heber Springs and the Little Red River. I've got several full boxes of flies and some other stuff lying around in the bottom of bags. Also, I can always get some flies out of the bottom of the boat, if worse comes to worse. Anyway, when we get back there are a few trips lined up and I am working on an outing for a weekend with an old friend. So, it looks like there will be plenty to report-on in the coming weeks and months. Hope to see you on the river and thanks for stopping by.